For a large Block Tread Pneumatic Wheel we have the BEST RANGE ONLINE, available for NEXT DAY DELIVERY! 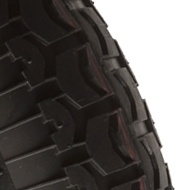 These are a popular chunky and durable pneumatic tyre, with a deep block tyre pattern for added grip from grass to gravel. Ideal for outdoor applications and able to carry up to 200kgs each. A strong and durable pneumatic wheel which can suit 8 different axle sizes ( hub bore ) from 12mm up to 1" ( 25.4mm). You may prefer to choose a wheel with a ball journal bearing (PWP) as this makes moving equipment, trolleys, boat launching trolley wheels much easier, especially in wet or marine environments. We can also offer you a plain bore (PW ) wheel with no bearings for a simple maintenance free option. The most popular is the needle roller bearing wheel ( PWR) as this is the best of both worlds , a strong pneumatic wheel that fits all axles and can be moved easily. For more information on choosing the right wheel visit our measuring advice page.